Surrey, BC - The Surrey Eagles are pleased to announce that defenceman Matthew Dawson (1996) has committed to play for the hockey club, beginning in the 2013-2014 season. The Delta native officially joins the Eagles after playing a role in Surrey's run to the RBC Cup this past season as an affiliate player. "With the departure of some of our key blue liners from last season, we're excited to have Matthew join our club as a young puck moving defenceman," said Eagles Head Coach and General Manager Matt Erhart. "Matthew performed beyond his years during our run to the RBC Cup, and we're looking forward to him being a part of our team for the 2013-2014 season." 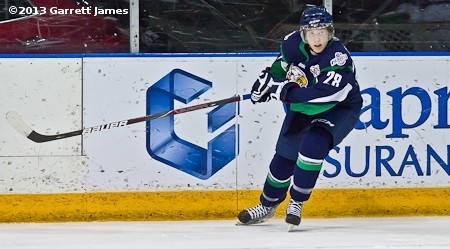 The 16-year-old played in five regular season games for the Birds in the 2012-2013 season before appearing in 13 games in the post-season including every game at the Western Canada Cup and the RBC Cup. Dawson, who is listed at 5'10 and 160 lbs, played for the Delta Ice Hawks of the PIJHL last year, posting two goals and 12 assists in 37 regular season games. "I'm very excited," said Dawson of joining the Eagles. "I finished the year with the team, and that was a great experience, but now to officially be a part of the team and the family is a great feeling." The Eagles would like to welcome Dawson to the organization.